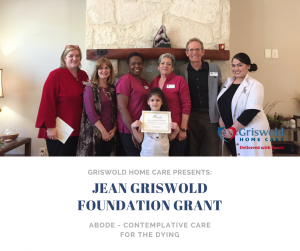 McGuire, Owner of Griswold Home Care of San Antonio, and Ryan McGuire presented Martha Atkins – Executive Director of Abode – Contemplative Care for the Dying with a Grant from the Jean Griswold Foundation. Abode’s mission is to offer compassionate, interfaith and spiritual care in a contemplative community so those who are dying, leave this world with dignity and grace. They teach the art of contemplative living and dying. The Jean Griswold Foundation was created in 2010 with the mission of supporting nonprofits to build, strengthen and sustain programs that enhance the quality of life for low-income and elderly adults. They have already awarded 38 grants across the country in 2018.